Firefighters discovered the body after putting out the fire. Three people are now wanted for murder after a woman's body was found in a burning car last month in Lawrenceville. 20-year-old Antoine Sims, 20-year-old Michael Smith, and 18-year-old Deshaun Flournoy are suspected of murdering her the night of Oct. 29, Johns Creek Police said Tuesday. 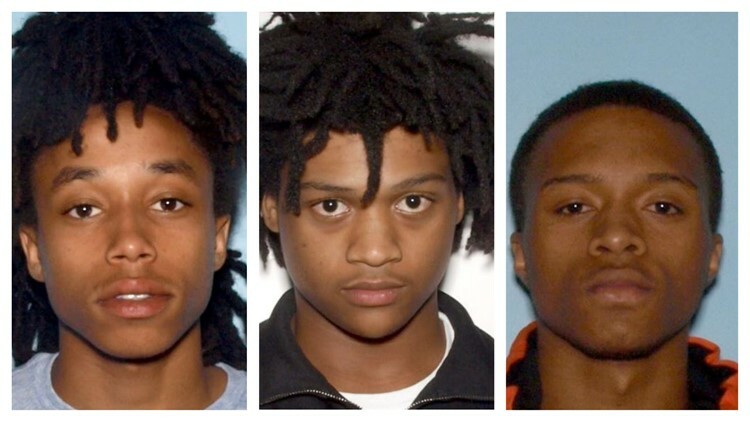 FROM LEFT: Antonine Sims, Deshaun Flournoy and Michael Smith are wanted for the murder of a woman found inside a burning car parked in Lawrenceville. Sims is also accused in Gwinnett County of setting the car on fire a few hours later in Lawrenceville, with the woman's body inside the car, after, police say, she was shot to death in Johns Creek. 21-year-old Adelisa Muratovic's body was found inside a burning car around 3:30 a.m. Oct. 30 at the Springlake Cove subdivision clubhouse, in a small parking lot next to the playground. Here's what happened, according to Johns Creek Police: The night of Oct. 29, Muratovic, Smith and Flournoy went to a gated apartment complex in Johns Creek to meet Sims, to buy drugs. Police said Smith and Flournoy tried to rob Sims while Muratovic was waiting in the car. "We know she was coming there to purchase drugs," said Capt. Chris Byers with the Johns Creek Police Department. Byers said that when Smith and Flournoy tried to rob Sims, all three suddenly started shooting. "Shots began being fired between Michael, Antoine and Deshaun, all around the vehicle, where the victim was," Byers said. "At some point, she was struck by a bullet." Byers believes that shot is what killed Muratovic. Then, investigators said Sims drove her body from Johns Creek to Lawrenceville and set fire to her car. The car fire was fully engulfed when crews arrived. Firefighters discovered the body after they put out the fire. Police earlier said that Michael Smith came forward saying he had driven Muratovic to the apartment complex the night before. Police said Smith told them that he and Muratovic had driven to the apartment complex in Johns Creek to try to buy drugs. Police said that, according to Smith's initial story, someone began shooting during the drug deal, and Smith ran into nearby woods to escape. Police said that Smith told them he left Muratovic in the car, and that one of the alleged dealers--who police now identify as Antoine Sims--jumped in and drove away. Roughly six hours later, that same car was found on fire in the subdivision in Lawrenceville, with Muratovic's body inside. The information Smith provided with police aligned with 911 calls Johns Creek police got regarding shots fired in the area. Police went out to that scene when they first received the reports of the gunshots, and later found evidence possibly tied to the case. Sims is also wanted for purchase, distribution and sale of marijuana. Smith's additional charges are aggravated assault, criminal attempt to commit armed robbery and possession of a firearm during the commission of a felony. Flourney is also wanted for criminal attempt to commit armed robbery. Friends of Muratovic have set up an online fundraising campaign, writing about her and about their grief--without referring to the allegations police have made about her possible involvement in drugs--saying that they and Muratovic's family are devastated. They say she just turned 21 in September, and they remember her as "full of life, energy and dreams.... always smiling, loved people and was compassionate towards everyone she met." According to what the friends wrote, Muratovic's parents came to the United States "to give their children a better life," and they are in mourning. "No longer will they feel the love in her hugs, see the warmth in her smile or hear the excitement in her voice." Police are asking anyone who has information about the suspects to call 911.